An old story from 4 years ago, and becoming more and more true every day! Greg Mencotti worried he would never find a spiritual home. 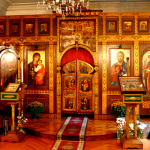 That led him to the Holy Spirit Antiochian Orthodox Church in Huntington, W. Va., a denomination with Mideast roots that, like all Orthodox groups, traces its origins to the earliest days of Christianity. said Mencotti, who was urged by his wife to explore Orthodox worship. But now about one-third of all U.S. Orthodox priests are converts — and that number is likely to grow, according to Alexei D. Krindatch, research director at the Patriarch Athenagoras Orthodox Institute in Berkeley, Calif.
Matusiak said growth is especially apparent in suburbs and commuter towns. “People in Wheaton weren’t flocking to Orthodoxy, because there was never a church here,” Matusiak said. says the Rev. Joseph Huneycutt, associate pastor of St. George Antiochian Orthodox Church in Houston, who was raised Southern Baptist then became Orthodox. Huneycutt, author of One Flew Over the Onion Dome, a book about conversion, and the editor of OrthoDixie, a blog about Orthodoxy in the South, said he was drawn to the faith by the beauty of its rituals and its teachings.